These earring backs are designed for our large titanium styles. 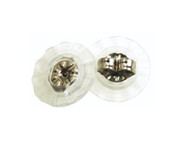 The medical plastic disc creates a push up effect so the large earring does not droop. The second photo shows the back with one of our large styles. The third image shows how the backs work. These back are sold in a package of 5 pairs.